"It's about time that a practicing engineer with casting and academic experience has written a book that provides answers to questions about squeeze casting and semi-solid molding/forming that many engineers and students of casting need answered." High Integrity Die Casting Processes provides a comprehensive look at the concepts behind advanced die casting technologies, including vacuum die casting, squeeze casting, and several variants of semi-solid metalworking. Practical applications for these processes are illustrated in numerous case studies. Key coverage includes a survey of liquid metal flow, strategies to overcome the limitations of conventional die casting, and potential defects unique to high integrity die casting processes. Also featured are methods for minimizing porosity, reducing cost by design, practical applied statistical process control techniques, designing for manufacturability, and containment methods for potential processing defects. 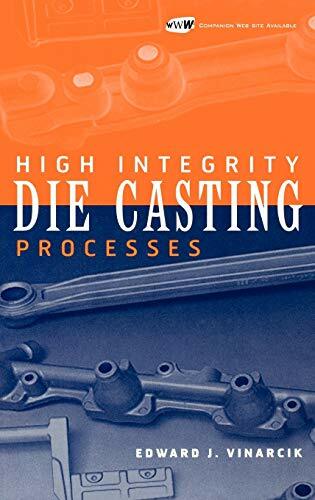 Several chapters present detailed real-world examples illustrating the broad range of applications possible using high integrity die casting processes. Included with this book is a CD-ROM containing PowerPoint(r) presentations for each chapter. These presentations can be used for training purposes in conjunction with numerous study questions designed to practically apply the ******* of the book to real-world situations. Selected PowerPoint(r) slides can be used to support engineering proposals, marketing presentations, or customer education seminars. جميع الأوقات بتوقيت جرينتش+4. هذه الصفحة أنشئت 08:48 AM.